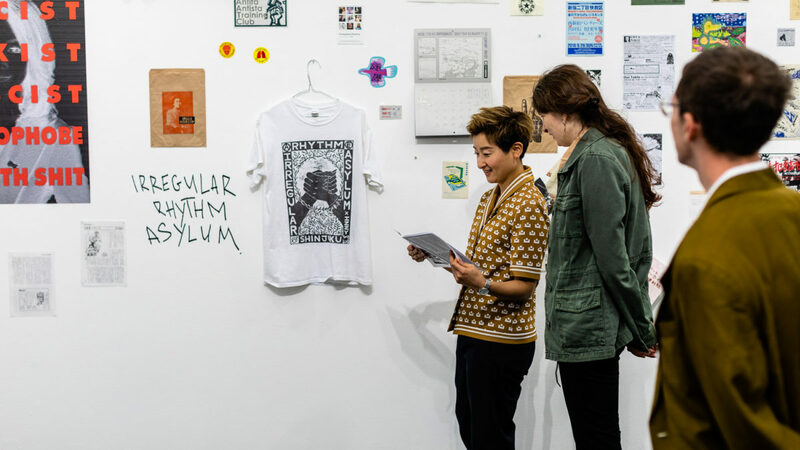 Kay and Hanna Stephens are sisters and co-editors of daikon*, a zine for sharing the intersectional experiences of South-east & East Asian non-binary people and women. The following is a conversation we had after watching Morgan Quaintance’s new film Letter From Tokyo, reflecting on our own experience of Tokyo as mixed British and Japanese people who have grown up in London. Hanna: When I was thinking about how to write this I thought about my own perception of Tokyo and how it has changed over time. I have memories from childhood of holidays swimming, playing with family friends and eating good food, so it was all very nice. But then living there as an adult and having to pay rent and things changed it a bit. I found working life quite hard partly because of the work culture and specific kind of customer service that I had to deliver, but also probably because I was young and had not worked full time or lived away from home before. I wasn’t very politically aware at that point either, but I picked up on a few things: the way certain kinds of foreignness were seen as cool, specifically white foreignness, but how other Asian or black people were perceived in a more negative light. I also remember meeting up with one of my colleagues outside of work and him telling me he was gay and that he hadn’t told anyone else at work because it wasn’t widely accepted in Japan. I guess his assumption, that he could tell me and I’d be okay with it, came from the fact that I was from London, which was interesting. Going this year and seeing a bit of the zine culture, and hearing people talk openly about being queer and the ‘Queer Shokudo’ space in Kyoto, almost took me by surprise. I thought: “oh, this is happening here”. And almost getting surprised about how surprised I was because it made me realise how much I had disconnected queerness from my experience of Tokyo, when there’s obviously places like Shinjuku and LGBTQ+ people in Japan too. Maybe the assumption that Japan is not progressive in terms of LGBTQ+ rights partly comes from a problematic place, but there is truth in that from what I heard by people directly in the documentary as well. There’s a worry that you’re going to portray it as backwards for acknowledging that, and play into the assumption that non-western cultures are inherently more backwards. But then if the people on the ground are actually saying, “it’s difficult for me to get by because of this aspect of my identity,” then you’ve got to take that in. Kay: What prevents that simple “oh it’s backwards” view is all the people resisting it, right? Like, wherever there’s oppression people are resisting – that’s at least a counterpoint to being like, “the whole place is backwards”. But I surprised myself too about how much I’d internalised the idea of Japan as quite ‘apolitical’. Hanna: So, you’ve been kind of subliminally influenced by that? Kay: I think so, yeah. And like the ‘excellent customer service’, the appearance of Tokyo as this kind of well-oiled machine… that does affect my experience of it. And even though I’m frustrated by it, I do see myself viewing it through that lens because of a lack of lived understanding and deeper political engagement with Tokyo. Hanna: That’s what Kei-san – the owner of the Irregular Rhythm Asylum infoshop – was saying in the documentary wasn’t it? Like if you just see it at face value, maybe you’ll see it as all the trains are on time and that it’s super well-run. But then, when you scratch the surface, there are a lot of societal issues. If you open your eyes, you can see it everywhere. Kay: Yeah, in the film when they were giving space to all these people who were resisting things like racism, fascism, gentrification, sexual violence and homophobia… giving voices to aspects of Tokyo that are made invisible upsets those fantasy constructions of Tokyo, and of Japanese people, as ‘robotic’ or ‘passive’. But it also somehow made it somewhere I could relate to more because it was highlighting social issues that I care about and that I recognise as existing within the UK too. I thought the parallel that Noma-san from CRAC (Counter-Racist Action Collective) drew between racism against post-imperial subjects in Japan and the UK, particularly in the wake of Windrush, was really interesting. It made me think of our own heritage as a mix of two colonial powers, which is really… unsettling. It’s really cool to see those struggles and feel connected to them – as processes that happen in many cities under post-colonial late capitalism or whatever you want to call it. We saw a lot of English slogans in the protest clips, which maybe speaks to a desire to connect certain struggles globally. But this also made me wonder to what extent the context-specificity of the struggles are lost in its accessibility to me, or to a Western audience more generally. Hanna: Yeah, I think the documentary serves the purpose of building a bridge, in the sense that it highlights some issues going on in Tokyo, whilst maybe missing out other things because of the language barrier, limited access to certain communities, and because of the way it was structured into those three parts. And I think also because of the intended audience… because it’s a ‘Letter from Tokyo’ which suggests that the intention was to communicate things to the outside, to a western audience perhaps, which I think it does well because of the way it’s structured and framed. Kay: Yeah, I suppose because of the bridge-building aspect, it focuses on those issues that have resonance in the UK. Like Kei-san discussing the rapid gentrification and changing architecture of the city in the lead up to the Olympics, which has clear parallels with the London Olympics and Stratford. Hanna: Yeah and also when Ito Tari – a queer feminist performance artist – was talking about the Pride parade… about its commercialisation and whether it really furthered the rights of LGBTQ+ people or created lasting structural change. Similar conversations are happening here. Kay: Yeah. But although I liked the emphasis on the global nature of certain struggles, I caught myself thinking the artists and activists were taking on ‘Western’ ideas and concepts, mainly because of the use of English words like ‘queer’, ‘anarchism’ and ‘anti-fascism’, and familiar protest tactics. Obviously, these concepts are transformed and take on their own meaning and life when used in a Japanese or Tokyo context, but I wanted to see that – it made me want to understand that better. Hanna: Yeah, I see what you mean. Maybe this reflects the fact that western perspectives are often framed as universal rather than context-specific which allows them to have a more global reach, and western knowledge or terms hold certain power because of western/white supremacy. Or maybe because of this, English has become the global language within which to frame or communicate struggle. So, it would make sense that western political thought is used as a framework. Or maybe we’re even assuming that the concepts in the film originate in the West when different iterations of them have existed in Japan separately too. But either way, English political terms and slogans appear a lot in the film yet Japanese grassroots struggle, or even more large-scale political protest, aren’t widely known in the UK. This suggests an unequal exchange. Kay: Yeah just recently I learnt about a decade long struggle against the building of Narita airport by local people and farmers in Sanrizuka. I didn’t know about that until this year, and I only heard about it because I was reading about a similar thing that happened in France more recently (the ZAD) and the author had written a footnote about Sanrizuka. Hanna: All in all though, I think the documentary does work as a good introduction for a British audience to some social issues and political activism that are happening in Tokyo. I think it acts as a good directory of contacts for viewers to get started in finding politicised spaces, to learn more about different issues within Tokyo, and to find safer spaces. But there’s obviously a lot more to uncover!